It's zombie versus Hedgehog in this enjoyable kart racer. Sonic & Sega All-Stars Racing is a treasure trove of classic goodness from the company's acclaimed library, with a plethora of characters, tracks and music inspired by its beloved video games. 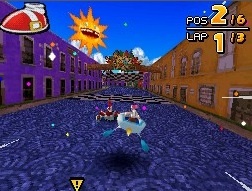 It also happens to be a fun racer and a fine compliment to Nintendo's Mario Kart DS, with plenty of items that'll help you reach the finish line while bugging your computer or human controlled opponents. Just don't expect much in the way of originality, as it plays almost exactly like the kart racers that have come before it. That issue certainly won't bother Sega fanatics that'll do back flips over the game's diverse cast of racers and tracks. There are 20 characters from the publisher's stable, such as mascot Sonic the Hedgehog, Tails, Knuckles, Shadow, Dr. Eggman, Amigo (from Samba de Amigo), Beat (Jet Set Radio Future), Ryo Hazuki (Shenmue), Ulala (Space Channel 5) and ones from lesser known games, like Billy Hatcher (Billy Hatcher and the Giant Egg) and Opa-Opa (Fantasy Zone), each of which rides in a unique vehicle. In addition, the game has 24 tracks spread across various games, including Sonic (Whale Lagoon, Ocean Ruin), The House of the Dead (Curien Mansion), Samba de Amigo (Sun Fair) and Super Monkey Ball (Sandy Drifts), among others. Even better, each one sports features from the respective games. Sonic's, for example, sport loops, while the ones from The House of the Dead have zombies shambling about. Some have slight learning curves (especially the twisty and confusing ones from Super Monkey Ball), but for the most part, Sega did a good job making them easy to navigate. Winning races, though, will take some skill, depending on difficulty (three levels), your steering skills and ability to use weapons. Like Mario Kart, Sonic & Sega All-Stars Racing has a variety of items that may give you a much-needed edge. The Rocket homes in and blows up the racer closest to you, the High Speed Shoe gives you a temporary speed boost and the Pocket Rainbow obstructs your opponents' view, and that just scratches the surface of the stuff you can use. Then you have the All-Star Item, a powerful pick-up that transforms the character and provides a brief advantage; Sonic morphs into Super Sonic, and Super Monkey Ball's AiAi barrels down the track encased in a transparent ball, knocking enemies out of the way. Overall, it's a fun and speedy game that offers a cool alternative to the competition, especially because of the modes. 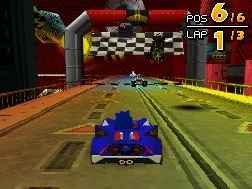 While it has the usual assortment of cups and time trial modes, you can also complete a series of missions (collect 50 coins and cross the finish line before time expires, pass through gates, drift while racing), race against other people via single-card (one-on-one), wireless and through the Nintendo Wi-Fi Connection (up to four). The more you compete, the more miles you'll earn, used to purchase additional characters, tracks and music. Obviously, people will compare this game to Mario Kart DS and it's obvious that Sega followed Nintendo's formula almost step for step. But there's certainly nothing wrong with that, especially when it's a quality effort like Sonic & Sega All-Stars Racing. Great for fans, casual players and kids (in other words, everyone), it's a well made, cool and value packed kart racer that's worth the cash. What's Hot: Twenty Sega characters, 24 video game inspired tracks, four-person racing, single card play, numerous missions to complete, catchy music. What's Not: Some weird track designs. We're looking at you, Super Monkey Ball.